A clone is a genetically identical copy of an organism, and it may be naturally occurring or created in the lab. Through the process of asexual reproduction, organisms such as bacteria (and some plants) create offspring that are genetically identical to the parent. Modern genetic technology can also be used to create clones. There are three types of cloning: gene cloning, reproductive cloning, and therapeutic cloning. Gene cloning is essentially recombinant DNA technology, where a piece of foreign DNA is inserted into a vector, which can be copied by a host cell. Therapeutic cloning involves the production of patient-matched stem cells for disease treatment. Here we focus on reproductive cloning of organisms. Reproductive cloning is the process by which a whole organism is cloned. First, a cell is taken from the organism that is being cloned. The DNA from this donor cell is then transferred to an egg cell whose DNA has been removed. The egg cell is “activated” and begins dividing as if it was fertilized. An embryo results, and this embryo is then transferred to the uterus of a surrogate female. After gestation is complete, the surrogate will give birth to the clone, which is a genetic copy of the animal from which the original cell was taken. 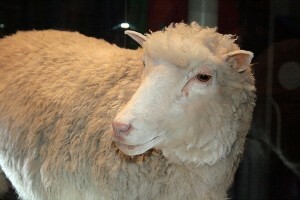 Dolly, the first cloned mammal, died in 2003. She is currently on display at the National Museums of Scotland, Edinburgh. Image courtesy of Wikimedia Commons. The first animal to be successfully cloned was a sheep named Dolly, who was born in 1996. So far, cattle, chickens, dogs, cats, horses and several other mammals have been cloned. Japanese scientists have even announced efforts to clone a wooly mammoth. Wooly mammoths went extinct around 10,000 years ago. Global warming has caused thawing in permafrost regions in eastern Russia, and recently the remains of several well-preserved mammoths have been found. However, for cloning to work, the mammoth DNA will need to be in near-perfect condition. Reproductive cloning can also be used to produce animals that are beneficial in a number of ways. Cloned animals can be used to test drug responses; one of the main benefits is that their reactions to the drugs should be uniform because they share all the same genetic material. Reproductive cloning is still highly inefficient, and cloned animals are not as healthy as animals born through sexual reproduction. While there may be many potential benefits to cloning in the future, the technology has to be refined and advanced before it is widespread. Campbell et al. Sheep cloned by nuclear transfer from a cultured cell line. Nature. 1996:380 (6569): 64–66.